Hello! My name is Sean McManus and I'm a writer based in the UK. I write books about business and technology, and have written a novel about the music industry. I've also contributed as a freelance writer to a wide range of magazines, and have worked as a copywriter on behalf of some of the world's leading technology companies. 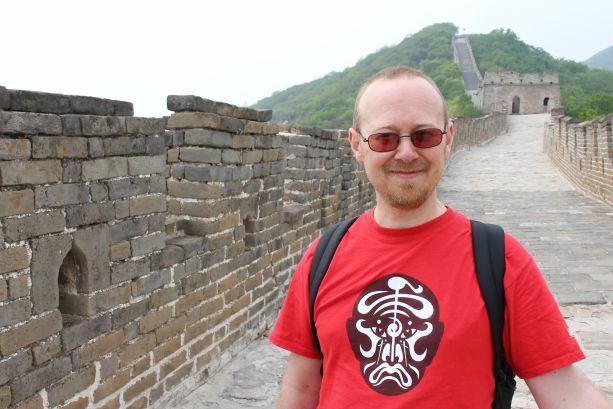 On the Great Wall of China in 2014. See my China photos here. I am a STEM Ambassador, and a Code Club volunteer, helping to teach children programming. I enjoy travel and photography, and am publishing galleries of my travel photography on this website. I've been lucky to have been able to travel to China and Australia, among other places. My Travel Photography Map (instructions here) shows some of the places I've visited and photographed. I enjoy working on collaborative art and theatre projects. As a member of a writing group, I have contributed to group-authored plays, performed by a local theatre group. In the summer of 2012, I was a volunteer performer in the opening ceremony of the London 2012 Olympic Games. I took part in the industrial revolution sequence. In 2013, I helped to create the Big IF windmill installation, campaigning for the G8 to tackle hunger worldwide. In 2014, I helped to plant poppies at the Tower of London for the commemorative installation Blood Swept Lands and Seas of Red. In 2015, I performed in the 150-strong choir with David Byrne's Atomic Bomb Band at the Royal Festival Hall, celebrating the music of William Onyeabor. I also performed, volunteered backstage and helped with the set build at You Me Bum Bum Train, an immersive theatre experience, in 2015. I am a member of a singing group that performs harmony arrangements of rock and pop songs, classic and modern, a few times a year. My other interests include retrogames (which were just called games when I started playing them), and songwriting (I play guitar and keyboards). You can hear some of my music below. I'm passionate about music. Since going to my first concert (Jean Michel Jarre's Destination Docklands in 1988), I've been a regular concert-goer. I've been lucky to see most of my favourite acts several times and to see many unique shows. I saw the opening and closing nights of Prince's O2 residency in 2007, and a rare solo show by Noel Gallagher in 1998. I was there the only time David Gilmour has played Atom Heart Mother in my lifetime, and the night he popped up on top of the wall to guest on Comfortably Numb for Roger Waters' 2011 Wall Tour. I've seen Bowie, Pavarotti, Madonna, McCartney, Quo, Pink Floyd, The Who, Genesis, Radiohead, Pulp, REM, Blur, Kylie, The Cure, Depeche Mode, My Life Story, Inspiral Carpets, Tom Hingley, Jesus Jones, Black and hundreds more. My favourite albums include Wish You Were Here (Pink Floyd), Waiting for Cousteau (Jean Michel Jarre), Everybody's Angel (Tanita Tikaram), Adventures in Modern Recording (Buggles), Never Loved Elvis (The Wonderstuff), The Head on the Door (The Cure) and Perverse (Jesus Jones). But I bet I think of something else the moment I publish this. It's so hard to choose. Virtual webcam. Refreshes every 60 seconds. You can find out more about my books here, and can browse my magazine articles here. You can chat with a virtual me here and contact me here.